How long has it been? Two days? Two weeks? Two months? Years? 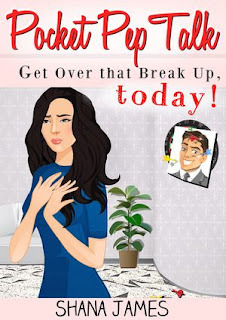 A bad break up can leave a taste so nasty in our mouths, we can find it tough to even get out of bed each day. But, is that any way to live? If you’re reading this, either you know that it isn’t or you’re hoping to help a close friend or family member see things that way, too. There aren’t many among us who hasn’t experienced the suffocating cloak of a bad break up at the hands of a jerk, but all misery has to have an expiration date or the fresh fruits of tomorrow will begin to wither and die. That’s where the Pocket Pep Talk comes in! In this text you’ll find words of wisdom, inspiration and insight, encouraging quotes and, best of all, tough love -- all geared towards helping you break the vicious cycle of wallowing in post-relationship misery, hindering the possibility for finding true, lasting happiness. The information is direct and concise, readily available to give you a good boost to get through your day when those foggy old memories of a deadbeat threaten to derail your happiness!